One of the earliest international articles about Moonlighting, this one is from a UK publication. They use the screen as a combat zone for sexual warfare -- a snappy, sassy, verbal battle entertaining enough for much of America to mutter happily "Thank God it's Tuesday". And now on Tuesdays, we can thank the BBC for Moonlighting, which in breaking all the rules, is television's new hip hit -- this year's Miami Vice. It's a celebration of words over matter. It's a detective show with little gunplay, few car chases. It's funny and sad, romantic and scary, running flat out on a verbal motor. 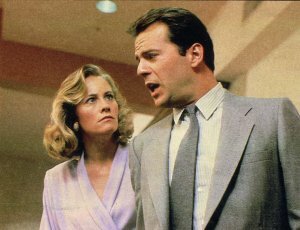 Episodes have won awards variously as Best Comedy and Best Drama, and there are three stars: Cybill Shepherd, Bruce Willis and the dialogue. And if you don't go along with the idea that the fastest, shortest way between two frames is a good line, then there's always the stars -- two genders, no chauvinism to look at. And they're shining. So what's all this fuss about Moonlighting? It's the crackling chemistry between Shepherd and Willis, a screen couple who get packed into sentences withe Myrna Loy and William Powell, Carole Lombard and Clark Gable, Hepburn and Tracy, and Bogart and Bacall. The teaming is, in fact, a shade more offbeat -- Shepherd is Hitchcock's icy Grace Kelly, wallowing in triple and quadruple entendres to Willis's crooked grinning Bogart. She's Maddie Hayes, gorgeous but cool former model, bankrupt by double-dealing circumstances which force her into running a detective business (the Blue Moon Agency) she started as a lose-making tax write-off. He's David Addison, a jolly bad boy (Motto: Live fast. Die young. Leave clean underwear.) who inveigles her into taking on the challenge and him. But none of that dog-eared plot stuff is vitally important. It's the blaze of dialogue fired by wisecracks and innuendos as Addison in Ray-Ban sunglasses and a New Jersey (as in Joisey) accent tries to melt Iceberg Maddie. He's constantly on the make but she's cute enough, skirting, avoiding and escaping as week after week he worries her like a bone. Discussion of any kind is something that there is little time for on the Moonlighting set. When cast and crew turn up at 20th Century-Fox Studios, they often find production notes with 'TBA' (to be announced) on stage 20, as Caron batters away on his typewriter in his run-down office. As the show's director, he's responsible for the atmostphere of almost live television that is conveys. Most of the script is written moments before the scene is shot, and this close-to-the-edge way of working has led to some innovations for the small screen, such as talking to the 'fourth wall' -- the camera -- so that you get one of the stars staring out of the TV with lines like, 'Here comes the car chase'. This kind of playing around and Caron's references to Hollywood classic film genres let to a lot of criticism form the critics who couldn't work out whether Caron was making a detective show, or something that took itself rather more seriously. Caron doesn't share their confusion. 'We're a detective show officially, that's what ABC commissioned me to make, but that's the one part of the show I like the least,' he says. 'We use it as an excuse to play a game and get on with the show. That's where it all comes from -- my boredom with the thought of being the 50,000th detective show on TV.' But once you'ver seen an episode, you realise that there is no chance of it being described as that, although people have tried to put all kinds of labels on it. It has been described as tongue-in-chic television -- and the 'Ghostbusters meets The Thin Man'. It's certainly different. Take the episode titles, for example. It's hard to avoid a television series with an episode called 'Every Daughter's Father is a Virgin', Buddy, Can You Spare a Blonde', and 'The Dream Sequence Always Rings Twice'. It was that last show, filmed partly in black and white, a nostalgic tribute to RKO and the movies of the 40's, which highlighted the magic of Moonlighting. In 'The Dream Sequence...', Willis is a combination film noir Bogart, Alan Ladd, and John Garfield who introduces himself like this: 'Name's Chance. Chance, Cash, Johnny, Brick, Lonesome, Chance McCoy -- but you can call me Zack.' He's the trumpet player and Shepherd is the singer (torching 'Blue Moon', of course) who in the story within the story meddle in a murder mess. The episode, filmed last year, was introduced by the late Orson Welles, a master of tongue-in-chic. 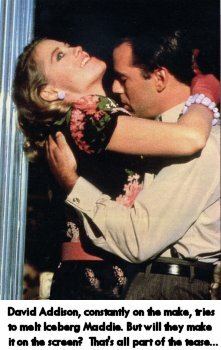 Welles was also a mentor of director Peter Bogdanovich whom Cybill Shepherd did not forget when she won a best actress Golden Globe for Moonlighting. Standing clutching her award, her evening gown at odds with her orange trainers, she thanked Bogdanovich for starting it all. She had been Miss Teenage Memphis and was a top -- right at the top -- covergirl when Bogdanovich saw her gracing Glamour magazine on a supermarket rack. She had the quality for the role of the town prom queen in his 1971 movie, The Last Picture Show. After the award-winning film, Shepherd and Bogdanovich spent eight years together making reasonably well-received movies like Daisy Miller and The Heartbreak Kid, and big bombs like At Long Last Love, and she took much of the blame. Even her pivotal role in Taxi Driver did nothing for her reputation as the not-too-talented blonde who dragged down Bogdanovich. They parted, amicably according to Shepherd, and she went home to Tennessee, to Memphis where she met and married car-part dealer David Ford, became pregnant (with their now six-year-old daughter Clementine), divorced, took advice (from Orson Welles) and began doing provincial theatre, singing and recording. Then, seven years after she left, she was offered a job back in Hollywood. Glenn Caron, who created Moonlighting and has his fingerprints all over every episode, says that at page 35 of his original concept Cybill Shepherd's face 'simply sprang off the page'. Finding his David Addison was not so simple and the casting has gathered a little legend with the success of Moonlighting. What is not in dispute is that he is, at 30, a star. 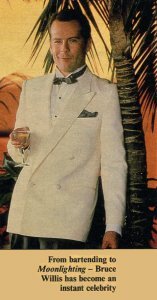 The other day he made what was probably the shortest appearance in show-business history (59 seconds) to announce he was endorsing a line of 'wine cooler' drinks for Seagram's. In return for appearing in seven television commercials Willis will receive between five and seven million dollars over two years with an option to renegotiate his contract for a third year. It's true, there is money in moonlightiing.